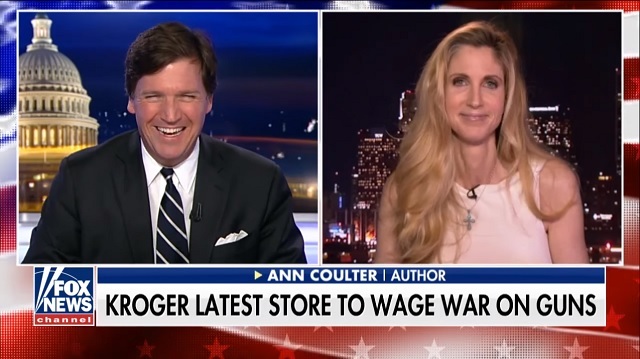 Ann Coulter mocked The Resistance for being "lockstep with corporate America" Tuesday on Tucker Carlson Tonight. "I don't care what your opinion is on free speech or guns or anything else, but please stop pretending you're a rebel," Coulter said. "Please stop pretending you're fighting the man when you are just lockstep with corporate America." "These are these new radicals we have, The Resistance, they'll check with corporate America you know Apple and Twitter, Facebook and their professors to ask if they can wear a 'question authority' t-shirt," she said. Coulter also said leftists are "creating, without realizing it, this really hilarious and ferocious generation of right-wingers." "These college students, they're listening to white privilege all day, every moment of every day, white heterosexual men are emerging from college barking at the moon right-wingers," she said. "They're fun to follow on Twitter." Coulter also discussed a recent Gallup survey which found most US college students, when forced to choose, say that "diversity and inclusivity" should take precedence over free speech. The survey found Democrats overwhelmingly favor the protection of feelings over free speech and Republicans overwhelmingly favor free speech over the protection of feelings.